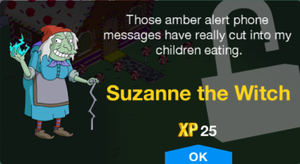 Suzanne is a witch who lives in a Gingerbread House. She takes in Bart and Lisa after they are thrown into the forest. She fattens up Bart and makes Lisa clean. When she says that she has a date named George Cauldron, Bart and Lisa laugh. As a result, she tries to kill them only to be stopped by Homer. Homer gets transformed by a few spells before he throws her into the oven, cooking and killing her. Then George Cauldron comes to the door only to be told Suzanne will be another 20 minutes. 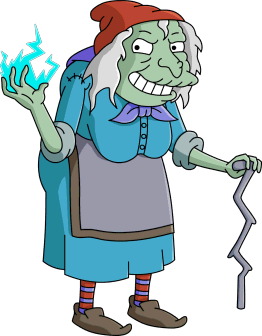 This section is transcluded from The Simpsons: Tapped Out characters/Treehouse of Horrors XXIV. To edit it, please edit the transcluded page. Modified on January 5, 2018, at 08:05.